and Spelling of their Name. Even before I became involved in family history, I was confused about the spelling of my paternal grandmother's maiden name. Neither did I ever have a good feel for how to pronounce it. My investigations in Germany only increased that confusion, but also raised the possibility that understanding the variations in spelling might help illuminate the history of the family. To begin our study of this family, I have added a longer article referring to currently available records from Dinkelsbühl and Nürnberg that describe the family in greater detail. This page deals mostly with the spelling of their name and its meaning. I do not have a lot of examples to work with. They include entries by parish priests, church scribes, and clerks in the archives of Nürnberg. We already know to expect some variation from these writers as they wrote down what they heard, sometimes from illiterate people, or used spelling and writing conventions particular to their time, place, or personal preference. The other examples are a handful of signatures by Xaver Bayerl himself, or other members of his family. Additionally there is the inscription on Xaver's gravestone, presumably directed by another family member. One would anticipate that the family's own signature would be definitive, but you will see below a variation similar to that in the church-books. Given that there are elements of linguistics and orthography that are far over my head, let see what we might learn from an initial comparison of late 19th and early 20th Century signatures with the hope that some expert or other family member will stumble on this page and lend us some better understanding. This signature comes from the 1893 birth record of Xaver's daughter Dorothea. If the diacritical mark over the 'y' was functioning as an umlaut that changed the sound of the letter below, this is what I would have expected: an absent 'e'. Otherwise the letters are written essentially the same. Of note, although the clerk writes 'Bayrl' without an 'e' he does not use a diacritic as Xaver himself does. One year later in 1894 for the birth of my Grandmother Lina, Xaver continues with the marked 'y' and absent 'e'. I do not know if it is significant that he makes the 'r' in his last name differently than in the 1893 signature above. Both versions are acceptable variations in old German handwriting. (We can expect that a terminal letter might be drawn differently than one in an internal word position.) This alerts us that stylistic variations can occur in a single person's signature over time. Six years later in 1900, Xaver signs his name at the birth of his daughter Eva. He still drops the 'e' in his last name. He reverts to a prior style of 'r' and again uses an overlay bar on what I assume is the 'J' in Jakob. He makes his capital 'B' in a new way, more like Barbara does! Notice just below that the clerk writing the body of the entry uses some different notation over the 'y' (and does it twice). The signatures above are from the 1918 wedding of my grandparents Conrad and Lina. The fathers of the bride and groom are witnesses. Karolina signs her name Baÿrl. The first time I saw this, I was puzzled by Xaver's name. I interpreted that he had made a mistake and that either he or someone else crossed out the 'e' in Bayerl. I did not understand the placement of the Zweipunkt diacritic either: was it over the"e'? This last signature is by daughter Dorothea on the 1936 death record (in Nürnberg) of her father Xaver. The writing of Bayerl is most curious. There is no diacritic mark over the 'y' and she includes the 'e'. However there is also the overlay slash through the 'e' as was true in Xaver's own signature of 1918. I confess that I do not understand this but it makes it impossible at this point to assume that both Xaver and Dori both spelled their own name wrong. Is there some orthographic (spelling) convention of the early 1900's at work here of which I am unaware? I know that there were state mandated changes in alphabet, printing and writing in Germany at that time. Hopefully this is something an expert can help us with. Anyone know anyone? Above is the church-book entry of my father's baptism in 1919. (Click on image for full size.) There are no signatures attached, but I include it in his honor as Franz Xaver Jakob was named after his grandfather (and Godfather), but also to show that the writer spelled his grandfather's name as Bayerl. 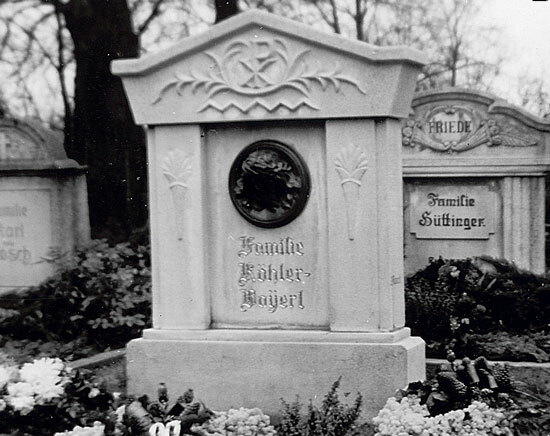 This final image of of Xaver's grave as it was in 1957. His name is spelled as he did most often as Baÿerl. Alas, my understanding is that the family lost their lease on the grave site and the the stone is lost to us. I do not know what the connection is to the Köhler family: another mystery to solve. I am still trying to understand and interpret. I put this information out in this preliminary form in hope that someone will come to my aid. Open questions include the following. 1. Is the diacritic ¨ being used as an umlaut that changes the sound of the 'y', or is it being used as a diaeresis that signifies that the 'y' is to be pronounced separately from the preceding 'a'? Or something else altogether? 2. What does it mean that Xaver himself included the 'e' after the ÿ? Did he not know the rules of German orthography? Perhaps Xaver just liked the look of the word! If he liked it that way, it's good enough for me. 3. Is there any significance to the strike-out bar in the signatures of 1918 and 1936? 4. Was Xaver the actual signer of the documents? It appears to me, especially looking at his first name, that he was. 5. Is there even such a thing as a ÿ with an umlaut or is that only acceptable for a, o, and u? What were the rules in earlier centuries? For example, I understand that the letter 'y' was not present in the original latin alphabet but evolved from the terminal 'ii' and then 'ij'. (In Dutch today, there is still a letter ÿ signifying 'ij'.) Where did the Bayerls come from? 6. What will I find if I go to Augsburg where the family lived in the early 1800s before moving to Dinkelsbühl? 8. What is the meaning, if any, of the name Bayerl? It may well be derived from the old German name for Bavaria: Bayern. How was that spelled over the centuries? A quick look at Wickipedia tells us that the name of Bavaria derives from the Bavarii, the old tribe of original inhabitants. The German name for Bavaria was the State of Baiern until the reign of King Ludwig (1825-1848) when it was changed to Bayern in a salute to ancient Greek culture. I have a suspicion that one of my family names evolved as a result of both orthographic and historical events tied to the name of Bavaria itself. 9. What can we learn from comparison to names like 'Meÿer? 10. [Addendum] Until after I wrote the above, I had not seen Baÿrl written with an umlaut in any church or official record. Just below are several examples from the church books of Dinkelsbühl of the spelling of the name of Xaver's father, Joseph. Unfortunately, but predictably, there is variation there as well. At least now we know that Xaver did not make it up himself. Looking back even further, I found other instances of the use of 'ÿ'. This is the earliest instance of the Baÿerl name in the church books of Dinkelsbuhl. The reference is to the birth of Joseph Carl Brüstle in 1856. His mother is my GG Grandmother Carolina Brüstle who was not married to Joseph Baÿrl at the time of the birth but married him the next year. Note the spelling in the third panel of "Joseph Baÿrl. There is some other language there that I do not understand yet. This is from the 1869 wedding of Josepha Catharine Engelhard. She is the half-sister of Joseph Baÿerl's wife Caroline. (Their mother is Catharine Brüstle Engelhard.) Note that the name of the witness Joseph Baÿerl uses the umlaut, but also adds the 'e." Additionally, the above comes from another family wedding in 1871, just two years after the last. The groom is Wilhelm Joseph Engelhardt, another half sibling of Caroline Brüstle Bayrl. The witness Joseph's name in the fourth panel is now spelled "Bayerl", which becomes a common one in the records. Thus we have the same three major spelling variations that we will see throughout the entire 100 years for which I currently have records. (Wilhelm Joseph has a large family. It is likely that any Engelhardts in Dinkelsbühl today are related to us. Note also that Engelhard is spelled both without (early) and with (later) a terminal "t.") I wonder what we will find in Augsburg and Affing? I have already ordered the records! 11. [Addendum 12-6-08] This is getting too long for one exposition, but the further back I go the more interesting it becomes. It is clear that in the church books of Affing, that the father of Joseph in early 19th Century was Leonard Baÿerl. I now have the records in hand to go back another 100 years. We will see what we will see! 12. What can you add?